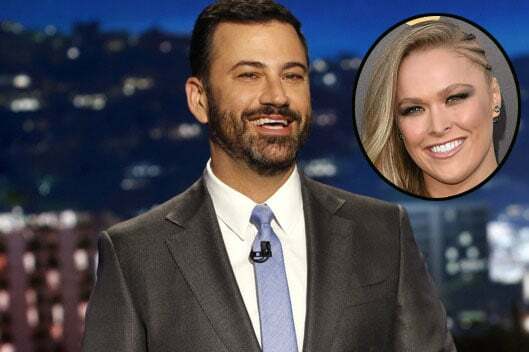 UFC fighter Ronda Rousey’s bloody defeat on Saturday at the hands (and feet) of Holly Holm sent ripples through both the sports and entertainment worlds, and Jimmy Kimmel was quick to weigh in on the “Furious 7” star’s shocking loss. “Ronda Rousey, who was not just the most dominant woman in fighting — you could argue she was the most dominant athlete in all of professional sports — lost her UFC title to a heavy underdog, Holly Holm,” Kimmel said on Monday’s show during his opening monologue. “[She] knocked her out 59 seconds into the second round with a kick to the head. It was a swift, brutal takedown of another woman — the likes of which I have not seen since Rosie O’Donnell and Elisabeth Hasselbeck co-hosted ‘The View,'” he quipped of his former ABC cohorts. “Glad to see that @RondaRousey lost her championship fight last night. Was soundly beaten – not a nice person!” the GOP frontrunner tweeted in response Sunday. Glad to see that @RondaRousey lost her championship fight last night. Was soundly beaten – not a nice person!